Today I have my buddy Ramit Sethi on the show. Ramit is a New York Times bestselling author and founder of I Will Teach You To Be Rich. His site reaches millions of people every month where he uses psychology and systems to help others to automate their finances, make more money, find their dream job, you name it. Why Ramit waited 10 years to write his second bestselling book. How he helps his students decide what business to pursue. How to validate your business before investing a lot of money. How to get your first customers. How to make money when you have very little to invest. Steve: You are listening to the My Wife Quit her Job Podcast, the place where I bring on successful bootstrapped business owners, and delve deeply into what strategies are working and what strategies are not with their businesses. Now today I’m thrilled to have my good friend Ramit Sethi on the show, and Ramit is the founder of the popular website, iwillteachyoutoberich.com. And today we are going to talk about his strategies for starting a successful business from scratch all the way from initial idea to execution. But before we begin I want to give a quick shout out to Klaviyo who is a sponsor of the show. Now I’m super excited to talk about Klaviyo because they are the email marketing platform that I personally use for my ecommerce store, and I depend on them for over 20% of my revenues. Now you’re probably wondering why Klaviyo and not a different provider. Well Klaviyo is the only email platform out there that is specifically built for ecommerce stores. Klaviyo can track every single customer who has shopped in your store and exactly what they bought which makes it extremely powerful. So let’s say I want to send an email to everyone who purchased a red handkerchief in the last week, easy. Let’s say I want to set up a special auto-responder sequence to my customers depending on what they purchased, piece of cake, and there is full revenue tracking on every single email. Now Klaviyo is the most powerful email platform that I have ever used and you can try them for free at mywifequitherjob.com/K-L-A-V-I-Y-O, once again that’s mywifequitherjob.com/K-L-A-V-I-Y-O. And if you are interested in starting your own online business, head on over to mywifequitherjob.com, and sign up for my free 6 days mini course. Just enter your email on the front page and I’ll send you the course immediately. Now on to the show. Steve: Welcome to the My Wife Quit Her Job Podcast. Today I have my buddy Ramit Sethi on the show. Now if you don’t know who Ramit is, you’ve probably been living under a rock. He is a New York Times best-selling author and founder of iwillteachyoutoberich.com. Now his site reaches millions of people every month where he uses psychology and systems to help others automate their finances, make more money, find their dream job, you name it. And what is double cool about Ramit is that he is fellow Stanford grad, which is pretty refreshing considering that I have interviewed my fair share of Cal alumni over the years. Anyway here is a quick story about Ramit and I know that most of you out there probably do not know about. So way back in 2010 when Ramit released his Earn 1K program, I was actually one of his earlier affiliate partners for his course. Now this was about a year before I launched my own class and even before I had an email list. So basically I read a blog post promoting Earn 1K, and I made eight sales in like six days, and that completely blew me away. Basically that was four- actually how much was it? So I think $4,000 in like six days, and after that experience Ramit actually indirectly convinced me to start my own email list and to create my own class. And today I generate millions of dollars over the years selling my course because I was inspired by Ramit’s success with Earn 1K. And with that welcome to the show Ramit, how are you doing today man? Ramit: Hey I’m great and I didn’t even know that story, so that is incredible. I’m really happy to have played a tiny part in that. Steve: So I think you were working with Charlie Hoehn at the time? Ramit: So true, that is very true. Getting an email list is one of the best things you can do. One of the biggest mistakes I ever made was taking too long to set up my email list. Steve: And not only that, I remember like your pair was half of the course sales, and I was thinking to myself, well if I create my own thing, well I get to keep 100% of that. And so that’s what kind of what inspired me to create my course in 2011 in fact. Ramit: Yeah, that’s great. I think more people should think about what skills they have and turn around and create classes. I do think that everybody out there is telling you to create a class, and we try to take a very different approach, which we can talk about today because we always believe quality first, and I’ve seen it myself. I’ve seen it to the tune of millions of dollars of difference between creating something that is super high quality and designed to stand the test of time versus just creating a piece of junk in two weeks, and just getting it out there because you want to make a quick buck. I think there is a huge difference, I love the craft, I want to talk about that, but I do think that every one of us has something interesting inside of us that other people might be willing to pay for. Steve: Absolutely and we’ll get into that more during this interview, but Ramit, you know most people probably already know your story. But one thing that I’ve always kind of been curious about is how I Will Teach You To Be Rich has evolved over the years. And so back when we first met, I think it was in 2013, you were more focused on personal finance, but now it’s just like so much more. So what is like the long term game plan for your platform? Ramit: Well, we changed a lot since we started. We started in 2004 and I started this not as some genius master plan. I started it out of frustration, because I was trying to teach my classmates at Stanford about personal finance and nobody really wants to listen. And in retrospect what college kid wants to talk about money and taxes and all that, nobody cares. So what I did was I started a blog because I got frustrated, and I figured maybe these annoying college kids will actually sit in their dorm rooms, and we can talk about stuff that’s fun. We can talk about the cheap friend who doesn’t want to chip in for his tip when we eat out. We can talk about how to make your money work for you et cetera. And that ended up being a great decision. The key learning I had from that was if you have a message that the world needs to hear, they might not listen the first time, they might not like the way you deliver it the second time. But if you keep persisting and you find the right channel, then people will sit up and they’ll pay attention. So when I started off with personal finance that was awesome. To tell you the truth Steve, personal finance isn’t what motivates me every day, like I don’t wake up and talk about oh, let’s talk about tax deferrals, who cares? 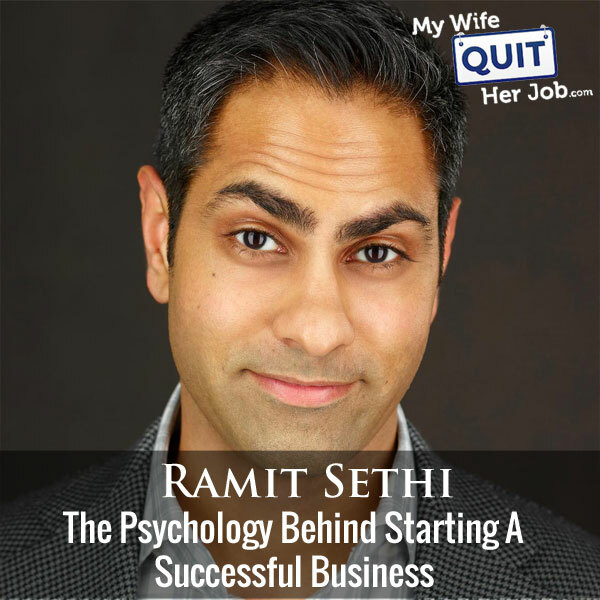 Ramit: But I do love psychology and I love using our behavior in pro social ways, so finding a better job, starting a business. So after I wrote a book and that did better than I expected, I started to see the potential of this business. And I learned about this thing called information products, online courses and really decided to double down there after trying a whole bunch of other options. So since then the business has really evolved. Money is one of our core areas, but we’ve also added on careers and salary negotiation, starting a business, inner psychology, we even talked about cooking. So every part of a rich life, if we have something valuable to add we want to create material round it. And what you’ll find is that our students who come to us. They’ll typically come to us for one reason, maybe they need to get their finances in order, they want to learn how to invest, or a lot of them negotiated $20,000 raise using our material. And then their eyes open up, they like, “Wait a minute, I can take these same principles and apply them to other parts of my life,” and that’s when they really start to stitch together their own version of a rich life. Steve: So the rich and I will teach you to be rich is more like rich as in rich life as opposed to rich as in money, anyway. Ramit: That is something I’m so glad you brought up because the first thought when people hear the word rich is a lot of time is just Scrooge McDuck. Sitting around, throwing gold coins in a vault, and swimming it and that is not my life. Now I will say this, I will say I think money is a small but important part of a rich life, and that’s why I started writing out about personal finance, because if your personal finances are not in order then it’s going to be very difficult to start a long term profitable business if you can’t even pay your bills. It’s going to be very difficult to focus on losing weight or finding a new job and being patient enough to do that if you’ve got bill collectors, or you are worried about if you can afford Starbucks coffee. So I believe it’s an important, small, but important part. And then I do think that a lot of people try to nag us into telling us what we are not allowed to define as our rich. “Oh no, you can’t go on vacation. No, you can’t buy that leather jacket. No, you can’t do that.” No, no, no, and my approach was always, let’s use our money to say yes. So if you want to go to Vegas and fly your buddies out with you for a weekend, awesome. Let me show how to do that. If you want to buy an expensive coat, beautiful, I’ll show you how to do that. You want to pay for your parent’s retirement; I can show you how to do that. So you define what a rich life is to you, whether it’s working from your home office like I do, or it’s going out and getting VIP service somewhere, that’s awesome. But I would rather say yes to a rich life instead of all the things you can’t do. Steve: Basically focus on what makes you happy and then spend less emphasis on the other things that you don’t care that much about. Ramit: Yeah, I mean if hear another person telling me to cut back on my lattes; I’m going to jump out of the window. I mean it’s the kind of advice that people say it sounds catchy, but nobody even follows. I know a lot of these personal finance experts; they do not care about spending. They love their lattes, and by the way if you actually ran the numbers and realized how much you actually save, three dollars a day for the next 25 years which by the way you are not going to do, it’s not even that much. I would rather get a $20,000 raise or start a profitable business and buy all the lattes I want. So a lot of times we forget that we are cognitive misers, and instead of worrying about 20 or 50 little things, we should focus on those five to ten big wins in life, get them right, and then you never have to worry about, can I afford this appetizer or this coffee. Steve: Those are great points Ramit, and I know that you talk about some of these things in your book, in your latest book called ‘Your Move: The Underdogs Guide to Building Your Business.’ One thing I was kind of curious about is your last book, ‘I will Teach You To Be Rich’ was released way back in 2009, and one question in my mind actually was, what made you wait so long to write this new book, and why did you decided to make it Kindle only? Ramit: Well, it’s really hard to write a book. Ramit: I mean, that’s the truth. You know my publisher, they had a very, they had a very good experience with the ‘I will Teach You To Be Rich’ book, and we were very fortunate because our community really rallied and made that book an instant New York Times best seller and all that. So of course they want me to write more, and I love the idea of taking my very best concepts and advice and putting it into something that stands the test of time. You’ll hear me say this a lot “Stands the test of time,” because I think that there are so many people and so much emphasis on creating the cool new Instagram video of the day, or the Facebook post is going to get a lot of likes. And I think that’s great, there is a time and a place for that, but 20 years from now I want my material to stand the test of time, or 50 years from now. I find some of the most valuable insights are in books written decades ago, and that is something I aspire to, and that’s what we design for. So I didn’t want to write another book just for the sake of it, I wanted to wait until I had something really valuable to say. As for why we did it with Kindle, Kindle only, we started there because we wanted to create something that was easy for people to consume, and we also wanted to — we are focused on experimentation, so we want to try different things and see how they work. You will notice if you really track our business closely that at any given time we are running many, many experiments. And I just think that living an experimental life is a really interesting way to live. It actually means you have to be pretty humble, because you might be good at what you do, but you realize that maybe 50% of what you believe is wrong. So you know I believe that eating this makes me overweight, or I believe that this price is the right price. Well, let’s figure it out, let’s test it and we discover very, very, very frequently that the things we were convinced of might actually not be true. Steve: So this book is an experiment in a way then. Ramit: Everything is an experiment. Steve: Okay, and what is your goal for your book, for this latest book as opposed to the last one? Ramit: Well, the last book was a technical book. Here is the deal. Many of the things that I do in life are because I’m super frustrated at something. So I started my blog because I’m sick of people not coming to my free class at Stanford. All right I’m going to start this blog, and then still the funny thing is nobody still actually came to my blog for like six months, but I kept at it, and finally people started to come. With the I Will Teach You book, people were emailing me asking these random questions, what bank account should I use or should I do a Roth IRA or a 401K? All these weird questions, and they are good questions, but after you hear them 100 times a day for four, five years, you start to say, wait a minute, I want to give them something I can hand to them and say, here are the answers to all your questions, and even questions you didn’t even know you should ask. So that was the IWT book. People got it and if you follow anybody who’s used that book, a lot of them since the book came out in ’09, many of them have generated over six figures, over $100,000 sitting in their bank account and investments, just following the basics in the book. This book, what I wanted to do was to show people like, yes, we have very advanced courses. Some of our courses are $2,000, or $10,000, okay, and when you are ready you can join us. But for a lot of people it’s not just the information that’s stopping them from creating a business, it’s first of all meeting people like them and seeing that other people have the same concerns or fears. Like do I have an idea? Do I have time? And kind of really showing them in an approachable way, hey lot of other people had the same challenges you do, so let me show you how they solved it. You may not need to use their exact techniques, but I find comfort in knowing what other people did to solve a similar problem. I also wanted to tell some of the stories that we’ve learned. You know we’ve been battle tested, and we have created over 20 products, we’ve done dozens and dozens of launches. We know a lot about what works and what doesn’t. And I consider it a service and an honor to be able to put something in the market place that we definitively know is true and it works because we’ve been doing it for years and years and years. As opposed to you know, somebody comes up with this thing about, oh, let me teach you how to do Facebook ads, you know, they’ve been doing it for four weeks, maybe they made a couple of thousand of bucks, and now they want to create a course. I’d rather wait, I’d rather wait, and do it right than arbitrarily do it quickly. Steve: So for all you guys listening out there, you know one thing that I like about Ramit is that he’s blunt. He doesn’t BS and plus he’s Asian, so I can totally relate to all the stories. But today what I was hoping to do actually Ramit is to kind of actually walk through the steps of building a business, some of the concepts that you talk about in your book, kind of from your perspective and from some of the experiences of the students in your class. And one of the most common question that I get asked since our audiences do overlap is how to find that profitable business idea. So what is your take and how do you actually help your students to decide what to pursue in the first place? Ramit: This is one of the most common questions people have. What should my business idea be? And let me first start off by saying that I can give you an amazing business idea right now, in fact I’m going to give you a perfect business idea right now that has generated millions of dollars, here it is. Teach people about personal finance. Ramit: Or teach people how to find their dream job, or teach people how to start a business or improve their social skills. Okay, I just gave you four ideas that have generated millions and millions of dollars. Now here is my question to you, do you know what to do with it? Of course not, because so many of us are using this idea that, oh I don’t have the perfect business idea. If only the perfect business idea fell down from the sky, then I would magically open my mouth, angels would rush out, and I would know exactly what to do. That’s not how it works. Okay ad one of the things — I’m glad you said that I try to be blunt because I think that more of us actually want someone to be blunt and honest with us instead of feeding us this typical BS. Find you passion, oh, passion solves all problems. No, it’s not true, your passion is great, but you know what makes me passionate? When I get really good at something, and when I help other people. So I will be more than happy to talk about how we find a business idea. But I just want to start by telling everybody listening, I can give you the perfect business idea, in fact I just gave you four, but it’s not just the idea, it’s the process of finding it, and it’s then knowing what to do with that idea. Ideas are a diamond dessert and I have a million ideas so does everybody. You do it right now, I’ll show you how find it, they are in your own head, but that’s just the first step. And when you can really understand it’s not just about the idea, it’s about actually executing on it, that’s when you have a real business. Steve: So let’s talk about the process and the initial execution to know whether that business first has legs or not. Ramit: Okay, all right. First off let’s start with the concept that it’s not magic, it’s math and Steve, are you good in math? Steve: I’m all right. I’m Asian. Steve: You are not, really? Ramit: No, I know, it’s very surprising. Steve: Oh I’m going to have to revoke your membership card then, I didn’t realize. Ramit: I know, it’s really bad. As and Indian guy, I’m not good in math and I don’t like mangoes, so we got a real problem here. The only math I’m good at is conversion rates though. I memorize every conversion rate of almost every campaign we’ve ever done, really weird. But anyway okay, you don’t need to know any advanced math for this. I’m just going to give you some real basic math. What I love about this concept of ‘it’s not magic, it’s math’ is that you know, we might look at somebody like Elon Musk or Bill Gates and say like, “Oh my God! They have something I don’t have.” And it’s true, right? They have a lot of skills and experience and resources that you and I don’t have, but at a very simple core level business is just very simple math. So I want to show you what a million dollars in revenue looks like, and I bring up a million dollars because that’s a good amount of revenue, and to the outsider it seems like pure magic to be able to generate a million dollars. But I’m going to give you about five examples of how you can make a million dollars, okay? Write this down, it’s not magic, it’s math. So to create a million dollars you could sell a $50 product and sell 20,000 of them. You could sell $100 product and sell 10,000 of them. You could price your product at $200 and sell 5,000, a $500 product you could sell 2,000 of those, or you could sell $1,000 product a 1,000 times. So to me this actually starts to be really interesting, because it’s approachable. I realize that if I can sell a $50 product five times, hey that’s pretty interesting. Maybe I can scale that up to ten and if I can do ten in a month I can probably do 20, and then maybe I could add on $100 product. So and it’s totally up to you, some people prefer the $5 products, some people prefer the $10,000 products. Now there is pro and cons. I have created products at all those points, so I could tell you about each. The point is suddenly it’s not just a million dollars in the cloud; it’s actually something that is pretty approachable. $50 product and if you can start to sell five a month which is not that much, then you can scale up from there. So that’s the first concept, it’s not magic, it’s math, right? Ramit: So what does that mean? We can’t do it? We better give up and go home and cry? Steve: Basically, basically they say there is too much competition out there, how am I going to stand out, right? Ramit: Oh life is so difficult, oh there is so many people who have brown hair, I better not have brown hair. Oh, there is so many people who drink Starbucks coffee, I better not buy Starbucks, what do you want me to give you, a hug? Hey, let me tell you a different way to look at it. When I started writing about personal finance, do you understand how many people wrote about personal finance, tens of thousands. There are entire bookshelves in book stores with personal finance books on. So what did I do? Did I sit and cry? No, first of all I got really good at knowing about personal finance. So I knew all the basics, I had read all the books. And I actually build my own system to manage my own money, and I started helping friends very casually with theirs. As I got further and further along, I started to realize there are certain things I disagree with and certain things I really agree with. This is why I’m one of the only people who talks about — forget about the latte thing, it’s irrelevant, and start talking about earning more. That came out of my discussions and my beliefs and my history, and I have a lot of other things that I was different and I have lot of other things that I’m similar on like low cost index investing. Well over time I started to develop what I was the same at and what I was different at, just like you know how any of us go through life. Same if you are a fitness instructor, you know there is — every fitness instructor under the sun is telling you basic things, cut you calories, move around more et cetera. But there is different gradations with inside of fitness. There is the good guy, there is women only, there is nerd fitness, there is a whole bunch of stuff. So what I would say is there is lots of ways to stand out, one is who is your audience? My audience that I was talking to was typically younger people. So when I use examples like flying out to Vegas or buying a round of drinks, that’s appealing to younger audience, not a 72 year old guy planning his estate taxes. Steve: How do you figure out which audience you should be targeting? Like so, let’s take one of your examples, like fitness for example, how do you decide which audience that you should be targeting based on your skill set? Ramit: Okay, so first of all if you have been helping anyone you can simply look at the people that you have ended up helping and see if there any patterns. You might often discover about yourself that you prefer to work with men or women, or just happens that you relate more or they relate more to you, so I would start there. The second is to ask yourself, who do I understand more, and the third and this is really important, which audience is willing to pay? We call this the pay certainty technique. You want to be certain that they will pay, and here is how it goes. All you have to do is ask two questions. Do they have the ability and willingness to pay? Ability and willingness. Let me give you an example. Steve, let’s say you are a stylist, you are just amazing, you dress really well okay, and everybody always compliments you on how you dress, and it’s something you just enjoy, you read style magazines all the time. So let’s pick three different example audiences and let’s see how we would apply this to narrow them down, okay. So audience one is 20 year old college kids, audience two is 75 year old retirees and audience three is 40 year old senior executives, okay. So let’s use this pay certainty techniques, do they have the ability and willingness to pay? 20 year olds, do they have the ability to pay? No, they have no money. Do they have the willingness to pay? What do they care? They wear hoodies every day, okay eliminated. Now let’s go to the retirees. Do they have the ability to pay? Sure, they saved some money. Do they have the willingness? No, they are wearing a golf shirt every day. Okay, oh I’m so mad Remit, you are stereotyping. I really don’t care about offending and stereotyping because at this stage it’s okay to come up with some guestimates. You are going to test those assumptions later. So I might — you know if I said, hey, I actually don’t think they are all wearing golf shirts, and I’m going to write that down and go talk to ten of them. I can quickly find out if they actually have the ability and willingness, okay? Now to the third category, senior executives, do they have the ability to pay? Yes they have money. Do they have the willingness to pay? What do you think Steve? So the answer is yes, but what questions would you ask these people to determine whether they would be willing to pay, because often times you’ll ask someone if they are willing to pay something, but then when it comes to time to collect the money, they don’t actually want to pay. Ramit: Yeah, that’s because people ask the wrong questions. Ramit: If you’d ask, “Hey, do you want to buy my weird eBook?” What are they going to say? They are going to say, “Yeah, yeah, just send me an email when it’s out so that I can send it straight to my spam folder.” Nobody wants your eBook, nobody wants your course, what they want is the outcome of what you can deliver. So my book is not called six weeks on financial literacy so that you can optimize your compound interest returns, it’s called I will teach you to be rich and I will. Similarly when you speak to someone, here is the number one question you want to ask is, you want to find out if they have actually tried to solve this problem in the past, that is the best determinant of whether they will try to solve it in the future, and when I say solve it I mean paid to solve it. Ramit: So for example, I would ask somebody, you know I might say, hey, tell me what’s going on, like walk me through your day, I’d love to understand your day. And I start of really broad. So they are like, well I wake up at eight and I drink coffee and I go to work and then I come home and watch Netflix. Awesome, I love it. Okay, fairly typical day, that sounds good, talk to me what happens after work. Okay again let’s say in this case I’m a fitness instructor. Well, I come home and I really, I try to work out about three times a week, and then you know, I come home da da. Oh, that’s cool, so like did you work out yesterday? Well, no, I’ve been really busy. What about the day before? No, it was raining. Okay, so on average a week, what would you say you work out? Two, I really should do four, but I really do two. So talk to me about that. Okay, right here so far I have, it’s not intrusive, I’m not asking them to buy an eBook. In fact in your research phase you cannot sell anything to them. You are not there to sell; you are just there to do research. What I really want to know is I want to hone in on that area where they say one thing and they do another. I really should keep a budget, I don’t keep a budget. I really should work out, I don’t work out. I should eat less, I should dress better, I should start a business, and then I want to ask them why. Now after I ask them why and they are going to give me some reason, I want to dig in, I want say have you tried to solve that in the past? Most people you talk to have not tried to solve it, you know why? Because they are not really serious. Oh, I should start a business, okay so have you tried? No, I’ll do that another day. Okay bye, I appreciate the time. That person is not serious. The best answer to that would be yes, yes I actually joined, I bought this book, I tried it, I like this part, that part didn’t work. Then I joined this course but that didn’t work either. Now I’m leaning in, tell me more. What would it look like if you waved a magic wand, what would happen, and I want to understand. This has nothing to do with price. Price is determined, way, way, way later and it’s not determined by your users, okay, and it doesn’t even have to do with how long your eBook is or how many videos are in your course. It’s all about their problems; this is pure research at the beginning. Steve: Okay, and so let’s extend that fitness example. So do you ask them why he works out in the first place or? Ramit: Absolutely, guess what? So this is where you start to – so let’s say you don’t know if you are better serving women or men. So if you ask, tell me a little bit more about why do you want to work out, what does it mean to you? And you are going to get radically different answers from men and women. Men in their 20s are going to answer differently than men in their 40s. Steve, what’s the difference between what a 25 year old guy would say versus 45 year old guy? Steve: For me I work out so I don’t get injured. Ramit: Love it, that’s a great answer. You think that a 25 year old is going to say that? Steve: Yeah, he wants to pick up girls. Ramit: Bingo. So again we are stereo typing and we’re generalizing, of course there are exceptions, and of course there is nuance to that. But at a high level if I were to create, get ripped six pack abs for 50 year old men, that’s likely to fail, whereas if I created a more vanity focused or aesthetic focused approach for 20 something men, that’s likely to succeed, and in fact that is exactly what you see in the marketplace. So you don’t actually need to worry about your competition, your competition if anything is telling you there is a big market here and a lot of buyers, that’s a good beacon. The good news is that your competition generally doesn’t know anything about business. They are usually not that savvy about marketing, they’ve never really studied this like the courses we teach, Zero to Launch and on and on. And if you actually do the research and ask the right questions and build a product for a hungry market, you can very often surpass your competition. Steve: So let’s extend that example a little bit further. So let’s say I have decided that I want to pursue fitness for 40 year olds. How do I stand out among the crowd? There is like thousands of thousands of personal trainers out there, thousands of programs, fitness programs. How do you stand out? Ramit: Okay, again when you say 40 year olds, let’s get even more specific. Ramit: 40 year old men or women? Ramit: Okay, what are some different types of goals that 40 year old men might have? Steve: Let’s see, not being able to plays sports better, recovery time, not getting injured, those are my goals and just general strength. Ramit: Aha, so guess which one of those stands out the most to me? Ramit: Yeah, you know why? Ramit: Because in general people particularly in America don’t pay for prevention. Now this is a little subtle nuance that you will learn over time as a business creator for everybody listening, but you kind of just think about it. Like do people pay for melt the fat around your stomach? Yes that sounds very appealing, or do they pay for live healthy life by avoiding these bad things and having a moderate lifestyle? No, they don’t care about that, not in this country. So when I hear you say strength, that instantly makes my ears perk up, and I say to myself, wow! Okay, so we have a 40 year old man who wants to improve his strength. So if I were going to position myself and go out there, the first thing I would go is I’ll go find ten to 20 40 year old men and I would talk to them. I’d say, tell me about your fitness goals, tell me about how you wake up in the morning, et cetera et cetera. And if they said I’m really interested in this, I would say, why? And they are going to tell me the why. So one, I’m going to know how to position myself differently. They might want strength so they can be a good role model to their grandchildren or their children, okay? That’s one example. Two, they might actually want to be as strong as they were in their 30s, okay. This is a common thing you will see in the beauty market, the old idea of you know, youth and beauty and regaining that, that’s another position. You want to talk to them and you want to say which of these is most appealing to you, tell me about what would it look like if you had a magic wand, and they are going to tell you in their own words. Suddenly all the other people who are out there, fitness instructors who are just doing six pack abs and these you know 25 year old guys, they are not appealing to those 40 year olds anymore, you are speaking to them. To give you one great example of this, I used to be a really skinny guy, I was 127 pounds. There is not a lot of stuff out there for guys like me especially back in the day. There is amazing program called bonny to beastly. Think about that name, bony to beastly. That is an amazing position in the marketplace for skinny guys who want to get bigger. So there are so many ways you can position yourself, but you want to identify your market and find out if they have a real pain they’ll pay for. Steve: So to summarize what you just said, in order to stand out you have to get super specific and focus on a small segment of the market? Ramit: And I can demonstrate that with I will teach by the way. Personal finance it’s very similar, so you know you can look at the core market from the outside and just be like, oh my God, there is some much competition. But when you get into it, you realize okay, most of the personal finance material out there is written for older people. Why? Because nobody really cares about their money until they are really 40. That’s just weird, but it is what it is. Two, it’s generally written with a slight masculine slant. That’s not as true anymore, but it used to be. And three and this is huge, almost every piece of financial advice out there is focused on frugality. Cut back on this, cut back on that you know, don’t buy any groceries, and reuse your toilet paper. I say I’d rather be dead than reuse my toilet paper or take out the oven light. Okay, these are real suggestions, I’m not kidding you. So I said all right, I’m targeting young people. My friends were generally, they had good jobs, they were fairly affluent, they wanted to go out, they wanted to have a good time. They didn’t want to cut back on everything, but they also wanted their money to go where it needed to go. And my background was in psychology, so I didn’t know this from day one, but I started to figure it out. I would write just the way I talk. So I was writing casually, I was using casual examples like the tipping friend. I was talking about not just cutting back, but earning more. That was unusual. And then I was also taking the conventional advice and showing why some of it did not work. So people enjoy that pointed view. If you can say, hey, everybody is talking about this for abs or back development or whatever, and you are saying here is how it actually works, that can be very powerful. Steve: Let me ask you this question since we are on that topic. You mentioned that you wrote in a certain tone, you were very blunt. And one of the questions I often get asked is, if I’m starting my own business, do I have to be — does my personality have to be in it? Meaning do I have to show my face when I sell a product? Ramit: Absolutely not, and in fact the little known secret of a lot of online businesses is that there are certain people out there using pen names just like they were novelists. Ramit: So you absolutely do not have to show your name if you do not want to, and you can use a pen name if you like. What I find with my students, the students who join Zero to Launch, a small percentage of them have this concern. Typically it’s for professional reasons, they might not want their co-workers to know they are talking about X or Y topic. What they typically find out is after they do this for a year or two, they realize they actually don’t mind anymore, and that they are happy to share their name and their face, and it actually makes a decent impact to the business. Ramit: We saw this in the personal finance world by the way. You know this Steve, like a lot of people in their early days had pen names, and then eventually they came out and shared their names and it was perfectly fine. So if you don’t want to share you don’t have, but ultimately it’s really not that big of a deal is what most of my students find out. Steve: Okay, so let’s say okay, so we have come up with the idea at this point and we’ve got really specific about the target customers, how do I get my first paying customers? Ramit: Okay, so at this stage you have come up with a few ideas, you’ve picked one and you’ve decided to kind of spend some time on it. So you’ve gone through, you’ve talked to 15 or 20 people. How do you talk to them? Well, I always say if can’t find them during research, how are you going to find them during sales? So if you are going after pair up with somebody you want to learn a violin or people who want to get into college or whatever, whatever the topic is. You better be able to find those people and it’s actually not that hard these days. There is Reddit, there is forums, you can set up emails. And the truth is most people will actually talk to you and they’ll talk about openly. They’ll talk about their problems if they believe you are willing to listen not you are trying to shove something down their throat, okay? So like I will have conversations routinely with people who talk about relationship problems, they will talk about fitness stuff, they will talk about very emotional stuff. I would strongly encourage you to talk to at least 20 people. When I say talk to, email is okay, phone conversations are the best. One phone call conversation is worth a hundred or even a thousand survey responses. So after 20, you start to say like, oh wow! This is really — people are interested. In fact if you are really good at your research, by the end you’ll have people saying things like please if you create something like this please take my money. In fact I’ll be willing to sing up right now knowing that it’s not even ready. People actually say that. And if that is the case at the end your call, you can say, hey, I’m planning to think a little bit more about this. I might create something you or not, can I add you to a tiny list, and I’ll email you when I’m ready? This is a very simple way of getting your first five to ten buyers. And so if you’ve done your research right and you’ve found people who are interested, they will easily buy your first products. Exactly what I did with my first products. If on the other hand, this is very common, you don’t really listen to your market. You think that when they say, oh yeah I may be out to buy that, that that’s a yes, and then you kind of create this product fast to just make money, then the minute you go to sell it people are not going to pay. And that is in my opinion a huge tragedy, because your time is limited and you should spend it building something that can actually help people that they want to pay for. Steve: So to figure out exactly whether they are truly going to pay for your product, would you recommend taking a small amount of money upfront? Ramit: You can do that. You absolutely can. I don’t think that’s the only way, but if people are serious, you can absolutely say hey, you know I’ll be willing to put you in the top five or first in line, and I’ll take a deposit. It’s totally refundable, you know, 10% or 50%, honestly all that matters is they pay you $1. Ramit: The difference between zero and $1 is massive, massive. So many people for example don’t understand that if you have 100 people on your email list maybe 0.5 of them will buy particularly as you scale up. So don’t be angry if you talked to 20 people and 19 of them don’t buy, that’s okay, maybe they’ll buy later maybe not. But the law of internet numbers says you are going to have a bigger denominator than the number of buyers. Steve: Where are some of your go to places to do your research? Ramit: I love Reddit although you have to take it with a grain of salt, because people there are cheap, angry, bitter, and young. But aside from all that it’s great. No, there is a lot of great insights there. Like I love reading about you know if you’ve tried to lose weight but you’ve failed why. I love reading about relationship things, they have money, personal finance, there is some really good stuff, you just need to take it with a grain of salt. I love Quora; I think it’s really good. I read a lot of forums, so if you are looking into style for example, there is styleform.net, there is a whole bunch of stuff. And then the best of all is I actually love knowing people from very diverse backgrounds in real life. You will often find that people will say certain things online and certain things in real life, and they often won’t cross over. So the best research incorporates both, because people online will though often be anonymous, they’ll be more honest in certain ways, but they won’t talk about certain things. Only somebody you know who trusts you will open up and share you know often times the real biggest fears and pain points about a certain topic. Steve: So I guess that implies that it’s much more important to get someone in person, right? Because they will be more — yeah. Ramit: The better. Yeah and again if this intimidates you, good, it should. It’s not supposed to be easy. This is why you are competition, you don’t need to be worried about them, because how many people do you think actually talked to even five prospects in their market. I’ll give you an example from my book, okay check this out. When I was starting to write the book, I went and I bought like almost every personal finance book that you can read, all right, and I read all of them, took notes on every single one. And I actually went to Barnes and Noble and I would just be sitting there browsing, and I’d see people browsing next to me. Okay, here is the fascinating thing, Steve in virtually every single personal financial book, what does chapter one start with? Ramit: It starts with okay; let’s figure out how much you are spending so we can start a budget. How do you think the average person feels when they open a book and see that? Steve: Probably a negative feeling like as if I don’t know how to budget already. Ramit: Yeah, what else? You are right about the negative feeling, but they don’t know how to budget, they don’t and they know that. So why do they feel negative? Steve: That they have a problem. Ramit: Yeah, so the average person picks up a personal finance book, and the first thing they are told is let’s figure out how much you are spending, okay so let me get this straight Mr. or Mrs. Author. You are telling me that number one, I need to do a bunch of work to figure out how much I’m actually spending, because I don’t even know how where my accounts are and the passwords. And number two, I have this feeling in the back of my head that I’ve been spending way too much for the last ten years, and I don’t even know how much debt I have. No, thanks I think I’m going to put this book back on the shelf and go you know, eat a piece of cheese cake, okay. Ramit: So you would only know that if you had talked to people. You would never see that online. No one would ever even have the knowledge to share that. So instead with our book the first chapter, instead of telling you how bad you are doing, and all the things that are wrong with you and you are a horrible person, it was, hey, you’ve got a credit card; I’ve got a credit card. Let me show you how to beat the credit card companies at their game. And in that first chapter a lot of our readers you know, they beat a $22 late fee; those students are students for life. So when you are thinking about doing your research, you are going to discover these things only talking to them in person and on the phone. Don’t be an internet nerd and be you know, so afraid of talking to people. If you want to start a business and you want to grow it past ten dollars, past $100,000 into the seven or even eight figures, then you are going to have to get comfortable with being uncomfortable, and that means talking to people. The first four, five times, maybe they are not going to go that well, but that’s okay. You can just tell them openly, here is a script you can use. Just say look, I’d love to ask you a few questions about fitness. The reason why I’m asking is I’m thinking maybe of creating something, I’m not sure, maybe I will, maybe not, but I just love to talk to you and see how you think about fitness. And if it turns out into something that would be awesome, but if not I appreciate the time. Super candid, supper causal, not weird at all, and that is how you are going to get people to talk you. Steve: How important is it to have to your own platform? Ramit: We see so many courses that have come telling people you know all these tricks to do on Facebook and Instagram et cetera. And those are cool, if you want to that great, but every channel we see inevitably the channel creators like Facebook et cetera will constrict and restrict your ability to reach your own people. The best platform you can have is your own, one that you control, and typically that’s an email list. Steve: So I guess where I was going with that question was, is it a chicken and egg problem? Like should you work on getting a platform and followers first or should you just go ahead, jump into it, and just do what you are suggesting. Talk to a handful of people and just try to sell something before you have a platform? Ramit: Well, you don’t need to wait to create a platform. Okay, one thing that really annoys me that I see, is people creating all these unnecessary steps before they watch their business. Oh, I spoke to somebody yesterday, oh, I need to create a website, I need to learn how to learn how to do copy writing, and I’m like, no you don’t. You need to go find three clients. You can find that on Craigslist, okay. So can you talk to 20 people without having a website and opt-in follow? Of course these people want to be talked to. They want to be listened to. So you can go find 20 people. If I were somebody listening to this, I’d be sending out ten emails a day minimum. Okay, minimum ten emails a day, more like 15 emails a day to 20, and I’d be scheduling those calls. You can do 20 calls in one to two weeks, it’s no that hard. Ramit: But ultimately to scale, then you are going to want to have — you are going to want to create some content and give people a reason to come to your platform. And that’s how you are going to build a more sustainable business. Steve: Right, so the order that you would advise to proceed is to get those three customers, validate that you have an idea, then work on the platform when you want to scale. Ramit: Yes you can – that is absolutely the fastest way to go. Steve: Okay, okay. A couple of questions that I also get asked are from people who have very little money to invest in a business, and what would you suggest for these people? Ramit: Why don’t you get a better job? Ramit: I find it a little bit puzzling, I get emails from people who are like Ramit, I have 30 days left of money for my rent. I have no groceries, my fridge electricity just turned out, so I’ve got about eight hours of food left, can you help me start a million dollar business? Like no, go work. Get a job, get a good job, stop thinking about this passive income. That’s why I started off this whole call Steve talking about money is a small but an important part of a rich life. Starting a business is challenging, it’s not what everybody tells you, oh a million dollars overnight, it’s BS, people are lying to you. I’m here to tell you the truth, this is hard, talking to people is uncomfortable. You don’t know how to do it the first time. That’s okay you could do it, but it takes time. If you have very little money, then my question to you is why not first focus on getting a solid job, get stable, put a month of savings in the bank. I’m not saying that to be condescending at all. I actually think it’s the most respectful thing I can tell you because it’s honest. If you are down to a few weeks or a month worth of savings, and the clock is ticking, there is no way you are going to make patient long term decisions. No, no, no, instead you are going to make impulsive quick decisions to try to make a quick buck. And now you have joined everyone else out there on the internet who’s trying to make a quick buck. You talk about competition that is the competition you do not want to be in. One of the ways that we separated our self is by not having to make quick buck decisions. Steve, do you know one decision we made that cost us millions of dollars a year? Steve: Let’s see, you probably worked, you probably released a course, and then you cancelled it. Ramit: We’ve done that, we’ve done that many times and those I hope to never repeat, but they somehow always seem to come up every so often. One thing we do is we don’t allow anyone with credit card debt to join our flagship courses, and that’s nobody else in the market place does that because most of them would go out of business. We do it for two reasons, one; if you don’t have money, if you have credit card debt, you should use our free material which is 98% of the stuff on our site is free, and you should pay off your debt, okay. That’s what you would do, that’s what I would do. And the second thing we tell people is if we found out they joined with credit card debt, not only will we refund their money in that refund period, we will ban them for life. And so we actually turn down millions of dollars in revenue. That’s a way to stand out from your competition is who you serve. So I think that it is a bit disingenuous when people ask you know, I’m running out of money, I don’t have a lot, how do I start a business quick? These people are always the worst customers. They don’t have the fortitude or the patience. And again not to be condescending but to be respectful I would strongly encourage them, focus on your career, get a job, it’s much easier to get a solid job than to start a profitable and growing business. Steve: So Remit, we’ve already been chatting for 50 minutes, I want to be respectful of your time. It seems like you actually cover the entire garment, right? You teach people to hag at their job, the dream job in the beginning, and then transition gradually to earning their first thousand bucks, and then launching a potentially million dollar product. So where can people find you. Can you tell us a little bit about what you have to offer? Ramit: Yes, you can find all of our materials at iwillteachyoutoberich.com okay, and everything there is going to guide you to the right place. You should join our email list. You will really enjoy the emails; they are different than anything else you will see out there, I think you will really love them. And we have a new eBook on Amazon called Your Move: The Underdogs Guide to Growing Your Business. I think you are really going to enjoy it. We priced it low; we want everybody to get it. It’s on Kindle or any Android, any device. It’s going to be a quick read, and a really new way of looking at starting and growing your own business. Steve: Plus it’s three bucks, that’s like a no brainer. Ramit: Thank you for saying that. Steve: And the other thing is, join his list because the way it’s written is actually the way he’s been on the podcast today. He doesn’t hold back, he doesn’t sugar coat anything and he’s actually hilarious, especially if you are Asian, because you will actually get a lot of the Asian jokes. Ramit: Steve, are you basically telling all non-Asian people not to join my list? Come on, non-Asians you are welcome too, everybody is welcome. Ramit: I’m very inclusive on this list of 800,000 people, so please join in. I’d love to share. It’s not just about money, it not just about business. A lot of fun stuff about relationships and just a different way to look at life. I think in the first week you will be compelled by something you learn there. Steve: Yeah, and I’ll link up all this stuff in the show notes, so you guys don’t even have to memorize all this stuff. All right Ramit, take care, really happy that you came on. Ramit: It’s been a pleasure, thanks for inviting me. Steve: All right man, take care. Hope you enjoyed that episode. Ramit is someone who I’ve looked up to for many years now, and I highly recommend that you check out his latest book. I’ll have a link to the book in the show notes, it’s only 2.99, and it’s basically a no brainer to pick up. For more information about this episode, go to my wifequitherjob.com/episode172. Now I talk about how I use all these tools on my blog, and if you’re interested in starting your own ecommerce store, head on over to mywifequitherjob.com and sign up for my free six day mini course. Just type in your email and I’ll send you the course right away, thanks for listening.